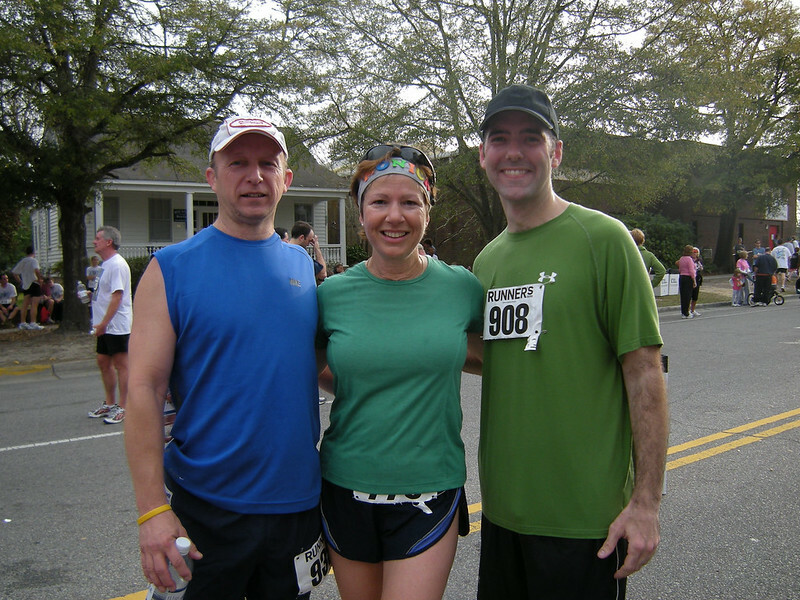 Another year, another Flowertown race. This one was pretty similar to the last one. The location was the same, the course was the same, and the crowd was light and easy to navigate through. This one is kind of special because it’s the first race where I actually carried the camera with me on the course. Since then it’s become a standard rather than a novelty. These days I only leave the camera behind when I’m feeling very serious about my time. I live in downtown Charleston now, so it’s a twenty-two-mile drive to Summerville. That’s a far cry from the meager two miles I drove when I lived there. At 6am there would be no traffic to speak of, but I didn’t want to push it. I showed up at about 6:30am and I had time to score a sweet parking spot and register before my brother showed up. (He still lives in Summerville.) 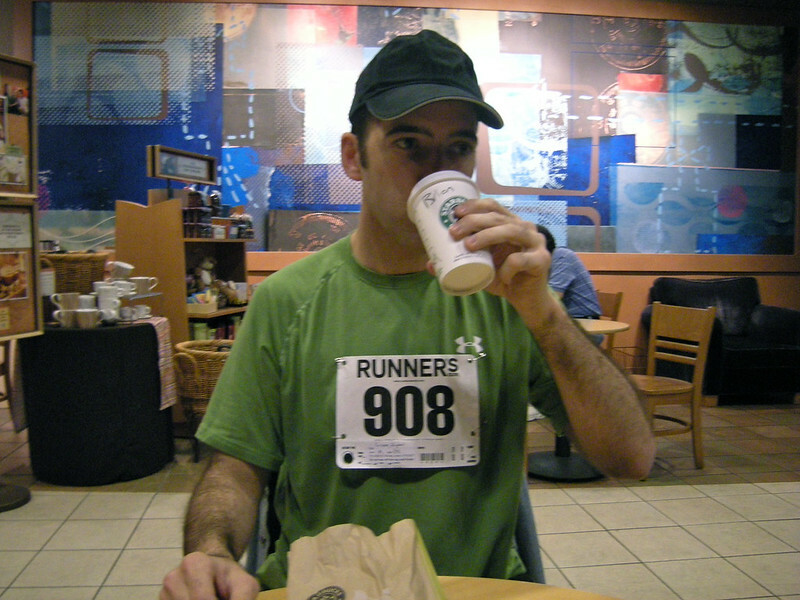 He and I went to the Summerville Starbuck’s for a half-hour for his hot tea and my tall mocha. I picked up a scone, too. With my employee discount it’s a pretty cheap way to grab breakfast. After our morning coffee and B.S. session, he took me back to the course and went back home. I settled into my standard pre-race routine: walk around and see if there’s anyone I know. If there isn’t, pick somebody and have a conversation until we have to go line up. Regular fare, really. Some folks were stretching while others were getting a pre-race stretch from the massage students. Everyone was in good spirits, and the day held a lot of promise. There was one thing I couldn’t believe, though… when I took these photos, I didn’t see John or Monica. I didn’t even think they were around. If you look at the photos, however, you’ll see them everywhere, along with some of the friends they usually run with. (Their names escape me now… I feel like a total stooge.) I’m not sure how I missed everybody when they were so close, but I’m going to blame it on getting up too early. 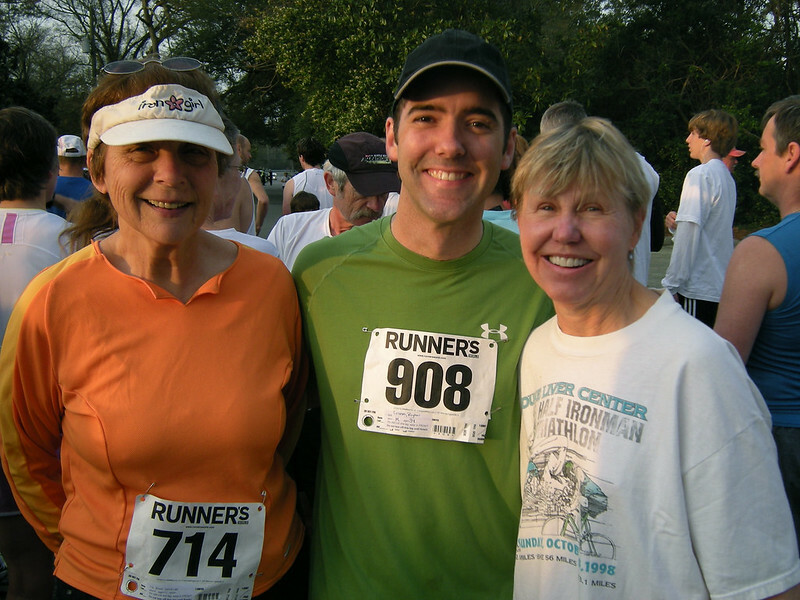 I saw Joan a few times at my Starbuck’s since the half-marathon, so I knew she would be around for the Flowertown Run. I’m always excited to see older people doing this stuff, for obvious reasons. I mean, that’s my future. I would love to be the old guy who’s still running these races. That being said, check out the photo below. Joan is on the right, and Donna Brown is on the left. I’m not sure about Joan’s age, but Donna is 71. She was the very last person to finish the half-marathon, but she did finish it. Can you imagine that? Seventy-one years old and she’s still doing half-marathons! Even more amazing than that, she didn’t start participating in races until 1994! The more I think of this, the cooler it becomes. We all have to grow older, but we don’t have to stop moving. We may not be as strong as we were in our youth, but we don’t have to be weak. It takes work, but with exercise you can really enjoy your later years. Not only will those years be of a higher level of quality, but there will be more of them. The start was pretty standard, just like everything else. The weather was pretty good, too. The only thing I didn’t like about the start was my speed management. I didn’t want to be worn out since I was going to be celebrating St. Patrick’s Day later on, but I didn’t want to kill my time either. 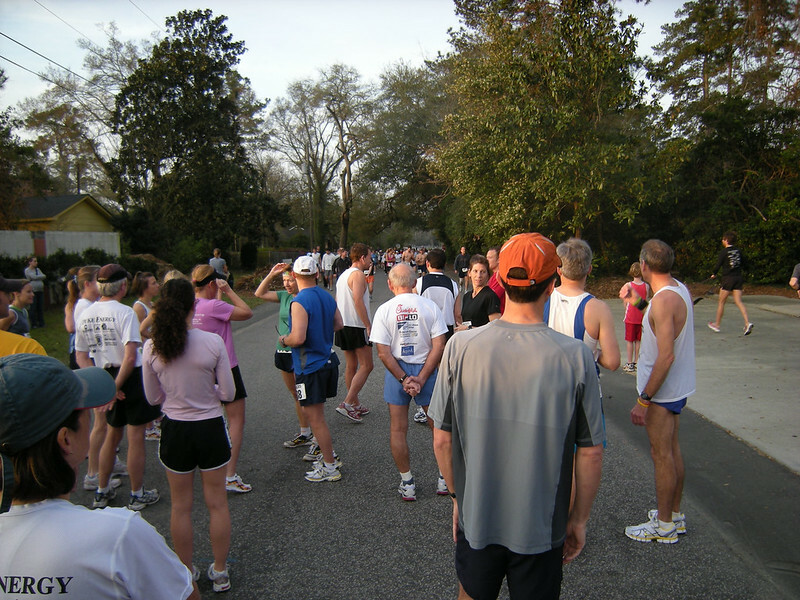 It was tough to figure out my pace when I’m around so many people of different skill levels. 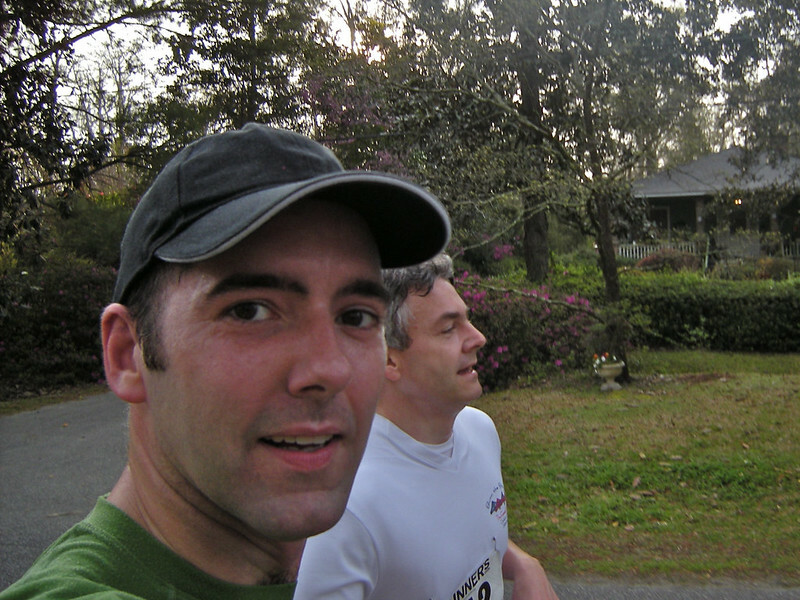 I’m a social runner, so I like to run alongside a partner when I can find one who’s around my speed. That sometimes conflicts with my plan for how I want to finish a particular race. It isn’t a big problem, though. After the first five minutes or so, people spread out and find their respective places on the course. I try not to pace with anyone until that happens. Even then, one person or the other eventually pushes ahead or drops back. It’s very rare to find someone who runs at your particular pace, unless you’re keeping a group together intentionally. Here you can see the guy who helped me get through the last couple of miles. His name is Frank, and he’s originally from Germany. We paced for a while before I pushed ahead, but he caught up with me. It was pretty cool. I pushed ahead again in the last half-mile, but he was right behind. His official time is 52:09, but that may be a second or two off. They didn’t have chips to record our exact times, so they were calling the numbers out verbally. I guess they have a little computer or a notebook or something… I’m not sure. All I know is that they have my time listed at 51:39 when I know I crossed under the clock at 51:37. Frank’s true time was probably more like 52:07. As is customary, I took a Finish Line photo of the clock just before I poured on the speed for my final approach. Unfortunately it was out of focus, so I took another one after I got out of the chute and walked around a bit. Below you can see a volunteer taking the little tags off of our race numbers. That’s how they kept track of who came in before who. Again, I’m not sure how they recorded the times without chips. I’ll have to check on that. Of course I saw John and Monica again. John’s knee is doing better, so he was in it with us this time. His official time was 54:22, but I saw him go through at 54:20. If there’s a two-second delay in recording the time, then that would make Monica’s true time 55:20. Looks like all of us had a pretty good cruising speed. This was a fun race. It was organized pretty well and the people were nice. It’s always fun to do a race with a smaller crowd, even if the Finish Line is placed on an uphill stretch of road. My next race is the Bridge Run. I can hardly wait.